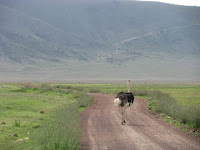 We arrived late at the Ngorongoro gate as nobody - not even the driver-guide who had been professionally doing the circuit for years - had informed us that entry was prohibited after 6 p.m. (welcome to Tanzania!). After a lot of haggling with the warden authorities and making necessary phone calls we were finally permitted to pass the portals of the park by when it was already dark. Tired after a long drive and wishing for a tot and a tap, we resigned to another hour’s drive on the rugged hilly road through darkness tunnelled by jeep headlights. The ranger accompanying us tells us that not many animals tread this path leading to the lodge as they prefer to stay away from human-vehicular traffic. Suddenly, as though to mock him, an African Cape Buffalo (a Big Five draw) appears in the spotlight, its eyes glittering glass, and we sit up fatigue disappearing, eyes peeled to the lit ground. And then, two lionesses white as moonlight emerge from the forested hills and make to sit by the wayside and we realize we are on a serendipitous night safari! Even as we are all agog with the sightings, our landcruiser halts – an elephant cow has decided to stride in the middle of the road instead of scurrying for cover, asserting its ownership of the land, making sure we knew who had the right of way. It struts as on a catwalk in the glare of the neon even as we follow gingerly in its wake. Crawling behind the humungous apparition for what seems like an eternity we only hope that it desists from doing a 180° turn to face us! 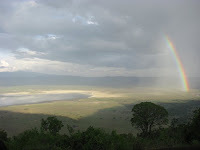 Thus begins our introduction to the world-famous natural heritage of Ngorongoro Park. We can hardly wait to see what is in store for us the next day. It’s dawn and as I step onto the balcony of our lodge room to unveil yesterday’s inky blackness, I find myself drawn into a cosmic haze, mesmerized by a silence born before sound. I can barely make out the hills rimmed against the crater, but the vastness of the vista and the hush swamps me and steals my breath away. The seemingly barren landscape is absolutely still. Nothing stirs, nothing moves, and no sound emanates from anywhere. You are confronted by a washed out water-colour painting in grey-blue. Just then, magically, the sun peeks out, the sepia tone now etching the panorama in finer detail and the silence becomes more pronounced. 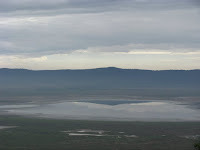 An elliptical water-body comes into view in the centre of the crater floor, so do savannah grassland in patches, some thickets and shrubs and the blue-grey gives way to subtle shades of green. You may be forgiven to think that there is no life here and that this is a crater on the Moon, although more evolved! As the sun eases into the sky and the morning settles in, bursts of birdsongs from the nearby thickets – barely audible, suggest a possibility of life. We are on our way for a day-long game drive. As we descend a good 2000 feet to rendezvous with the crater we come across yellow-barked acacias, yellow-flowering cassia and giant euphorbia festooning the hillsides. An Augur buzzard is perched on an acacia; the vision augurs well, as thus far, one had seen this bird of the hills only circling the Nairobi skies! The crater floor, 20 km wide, hosts diverse habitats from open grasslands to acacia woodlands and freshwater springs to soda lakes, and by virtue of that, nurtures diverse species. 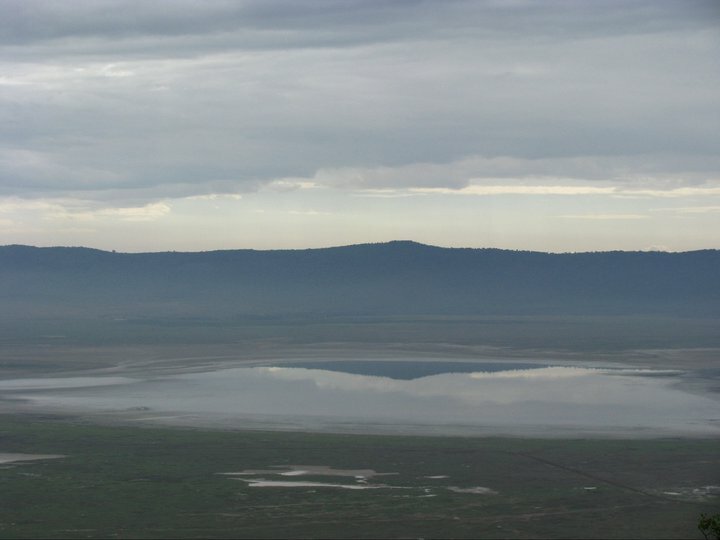 The big orb at the centre of the crater, chalky encrustations of mineral salts at the edge, is the soda or alkaline waters of Lake Magadi. This is the flamingo territory. On the open savannah greens interspersed with wispy tussocks of dry grass, in a sweep of sight we spot lions, buffaloes, gazelles, warthogs, wildebeest, hyenas and even a black rhino (a rare sighting, indeed). 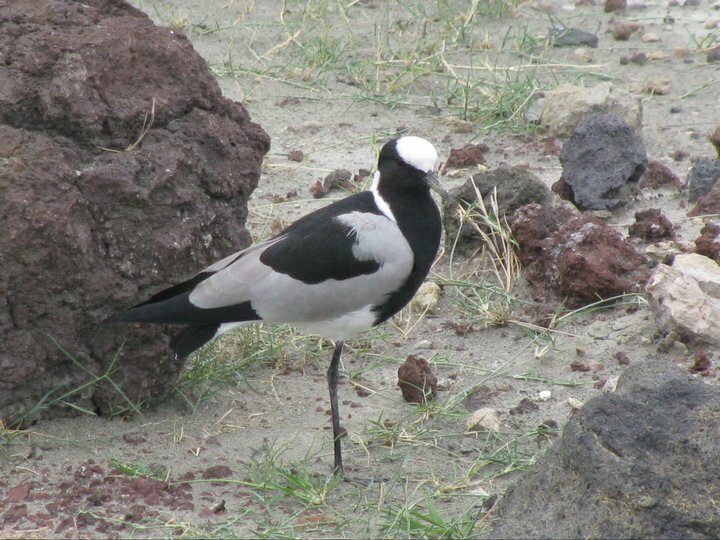 Migrant birds, White stork and Abdim’s stork, the size of warthogs or small gazelles mingle with the mammals in a stunning mosaic of wildlife. In the foreground, where all safari landcruisers stop, two nomadic lions are feasting on a wildebeest carcass – entrails spilled out, eyes stilled in deathly horror and dentures gritting in insufferable pain. From the look of the carcass, the nose nipped off and bottom bitten into, it becomes clear (the guide concurs) that it is a hyena kill that the lions have usurped. The hyenas are waiting in the wings impatiently to get their trophy back. As the lions doze panting hard the hyenas come to grab their meal only to retreat as the lion stirs and looks up. The ungainly scavengers slink away, but not ready to give up yet wait to sneak upon the ‘lord of the jungle’ … it is an unfair game! The next stop is a ‘picnic spot’ in the heart of the crater where all tourists (thankfully, not as many as in Mara) congregate to devour their ‘packed lunch’. Ngoitokitok spring is a freshwater pond with crystal clear water; yellow weaver birds are making nests on the rushes and egrets and ibises bunch in flocks on the banks. The tranquil blue waters and the human buzz lulls us into false security, wallowing hippos in the nearby swamp, notwithstanding, and we forget that we are encroaching upon wild territory. But we are only short-term visitors, here. The Maasai tribesmen have been living in this haven of perennial streams and sweet grass - amidst predators - harmoniously, for hundreds of years. They still cling to the traditional way of life, their manyattas clustered in the middle of nowhere. A manyatta of twelve huts indicates a clan where the chief has twelve wives! Red-robed stick figures herding black and white specks on the pista-coloured grassy downs of the rolling hills in the distance are a ubiquitous sight. Early morning, herdsmen can be seen - a spear, a stick or a rungu (club) in hand - guiding cattle from the top of a hill - home to elephants, to the valley below. By mid-day they are on the meadow – sometimes, under the sun, at times in the rain – with no tree or shelter in sight for miles! By sundown, they are wending their way to the top again… Children, too, gamely set about tending their livestock. I wonder at their arduous and ascetic life, though it appears facilely, to me, an idyllic existence, peering as I am from over a chasm of lifestyles and cultures. I wonder, aren't cows easy target for predators. 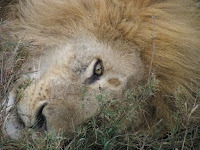 Interestingly, the Maasai is the only animal the lions fear! Smeared in cow fat and red ochre, his smell, literally, makes the lions see red and they steer clear of him. On our way uphill, we get to see few Maasai men and women closer up; they wear striking vermillion or aubergine chequered stoles or shukas. They may look scruffy and skinny but all of them ostentatiously sport bead jewellery – in their ears, on their necks and even on their ankles. Tiny beads the size of mustard seeds are woven into copper wires to produce stunning designer ensemble! Sandals made of reused rubber from car tyres have become a regular part of their attire, in recent times. You can’t help but marvel at their diminutive carbon footprint! Today, the Ngorongoro Conservation Area (NCA) is a unique cauldron where pastoralism, conservation and tourism meet in perfect balance. When the Ngorongoro volcano erupted, 2.5 million years ago, a mountain higher than Kilimanjaro came alive briefly, but the cone soon collapsed forming a crater. This caldera, the largest in the world, is a one-of-a-kind geological monument, rich in biodiversity. It is a heartening thought that the human species constitutes a natural element of this biosphere. Standing atop the mountain, looking over the caldera I feel privileged to be embraced into a time warp, to be able to experience a private bonding with the earth, which is nigh impossible in the rest of the peopled world. The volcano, we are instructed through panels at the Orientation Centre, spewed ashes far and wide and this formed the substratum that gave rise to what are today, the savannas of Serengeti! And this is to be our next stop. The route to Serengeti winds through the NCA and we take a detour to Oldupai Gorge, a Pleistocene era site where the legendary Dr Louis and Mary Leakey discovered the “Homo habilis” or the Handy man. The excavation site is better known to the outside world as Olduvai, but as the guide maintains, it is a distortion of the original, Oldupai, Maasai for sisal. And true to the name, sisal shrubs can be seen clustered especially here and not much elsewhere in the conservation area. The short talk by the guide, by the cliff overlooking the gorge, takes us on an incredulous journey 3.6 million years back where mankind began. Looking at the stone-age tools - hand axes, cleavers, choppers and chisels – in the museum, one can’t help but marvel at the enterprising nature of early hominids. 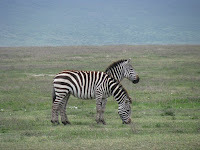 Serengeti, it dawns upon me then, is not only about wildlife, but about origin of life, itself. The plains stretch endlessly up to the horizon as though it were a golden ocean. To a mind conditioned by cityscape where space is interjected by buildings and man-made structures, the sight is awe-inspiring, its significance incomprehensible. I am standing atop Naabi Hill at the gateway to Serengeti National Park and wherever I cast my eyes, it is this vastness of space that swamps my senses. It is noon, the time when animals prefer to rest, take shelter from the scorching sun, but where is this oasis in the barren treeless savannas, I wonder. 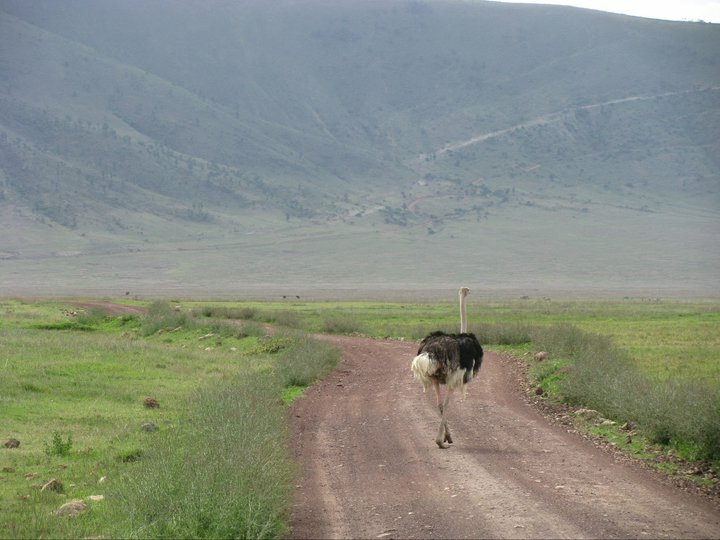 In Serengeti, where volcanic debris settled into a hard pan millions of years ago, the soil is shallow, and therefore not conducive to trees; only grass, that too, short grass flourishes here. 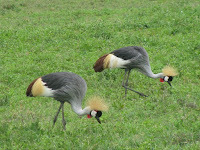 The savannas look listless, but wait; look closer and you see life coursing through its being. 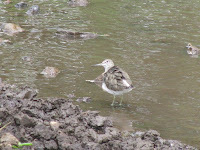 In the absence of trees and branches to perch on, birds sit pert on roadside rocks. 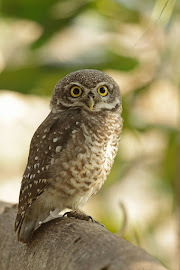 For the little bee-eaters, lilac-breasted rollers, wheatears and anteater chats buzzing around, hovering above the ground, it is prime time. Serengeti changes colour as if an invisible magician is waving his magic wand. On the one side you see honey-hued grass, on the other the shade has changed to olive green as in a double-tinted fabric. Termite mounds of clayey soil and fawn-coloured boulders morph into lions, caracals or impalas, when seen from a distance. And then again, what you dismiss as an innocuous patch of dry grass actually turns out to be a lion reclined on the savannas. One moment the sun is shining bright and the sky is clear, the next, you see clouds gathering over the horizon, there is thunder and raindrops come pelting and you are drenched in the open rooftop shower even before you realise that it is pouring. Apart from an occasional acacia, we come upon African sausage trees favoured by leopards and doum palms. The monotony of the plains is also interrupted by ‘kopjes’ or granite inselbergs crystallized over five million years. This isolated mountain of boulders, akin to the ones on the beaches of Seychelles, is a veritable botanical garden that supports plant life, and hence wildlife - from agama lizards to hyraxes, and serves as a good hide-out for cats. We are still on a reconnaissance sortie of Serengeti en route to the lodge but soon ease into the ‘manyatta’ cottages of Serena, freshen up and set out for a “real” game drive. 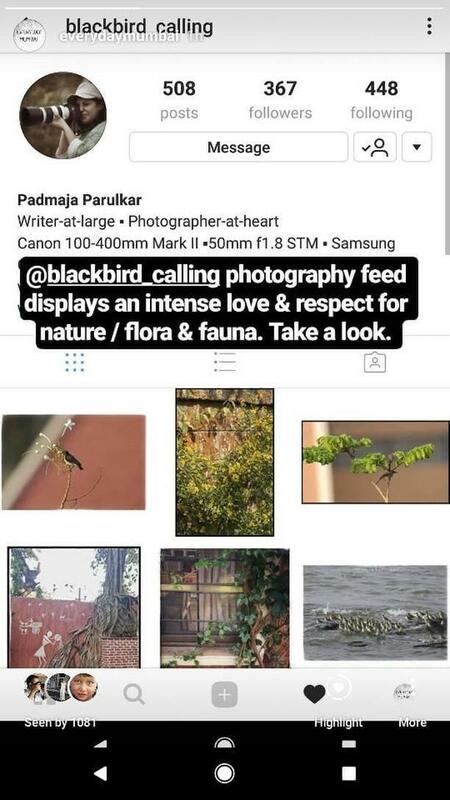 By now the sun has mellowed and the stage is set for wildlife action. 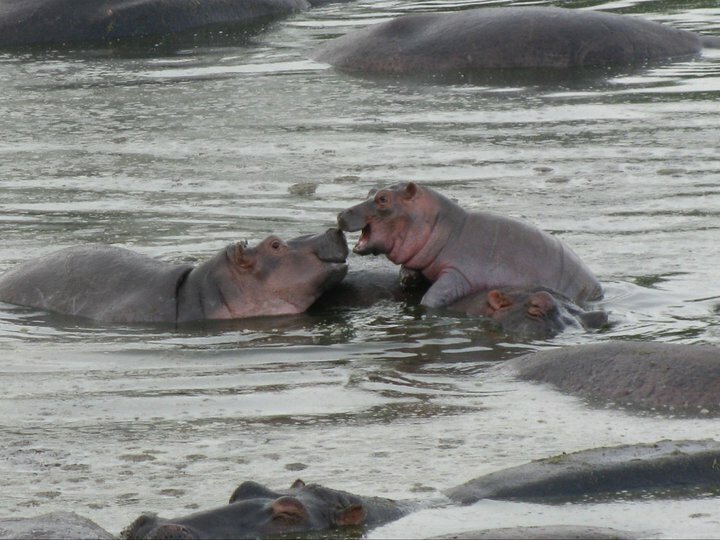 We head straight for the “Hippo pool” at Grumeti lake, where for the first time we get out of the vehicle and walk in the wild. Ears, eyes and nostrils dot the pool’s murky waters and there is much snorting, grunting and yawning happening on the surface. Gregarious hippopotami are huddled together wallowing in their own filth - there are young ones, juveniles, the elderly et al. The pool provides camera-toting tourists ample scope for great action pictures. I capture a baby clambering over its mother’s back playfully taking a nip at the sibling’s snout. It is getting to be dusk and as we head back, I come across a scene that seems a curtain-raiser for the night action to come which we will not be privy to. Marabous are perched like so many fruits on the bare branches of a yellow-fever tree and in dusk’s failing light, they at once, proclaim poignancy and privacy. 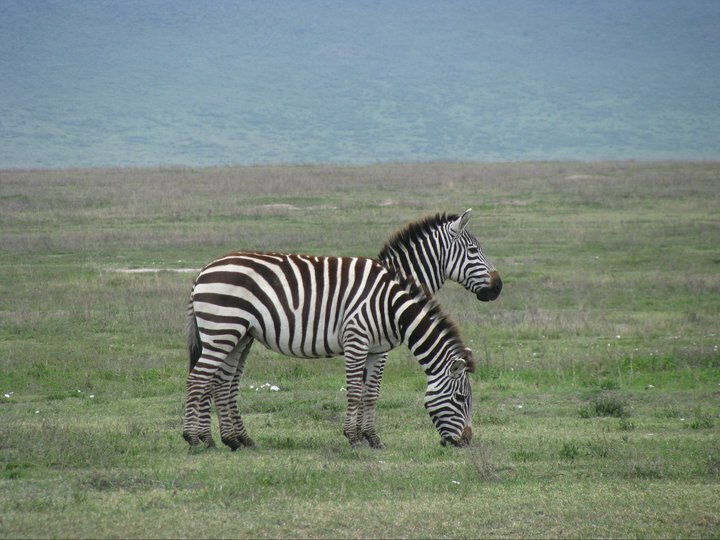 Serengeti is Mara compounded many times over, and as such the sightings are often from afar. From the stance, stride or skin, we were able to make out specks of hyenas and lions and we needed the aid of binoculars or telephotos to view them. Therefore, the next day when we get to witness a cheetah hunt in this vast universe, it is a rare experience indeed. A cheetah was crouched behind a termite mound, unknown to four “tommies” that were grazing unbothered. No clairvoyance was required on our parts to guess that the end was near for one of gazelles. In a trice, the cheetah was sprinting and in the melee that ensued three ran in one direction and the one that blundered in the opposite direction became the cheetah’s meal. Panting by its prey, the cheetah looked over its shoulder constantly for other predators and scavengers that might come by to steal its trophy. Less than a kilometre away, we had seen two lionesses and it seemed daring of the cheetah to hunt in the same territory. 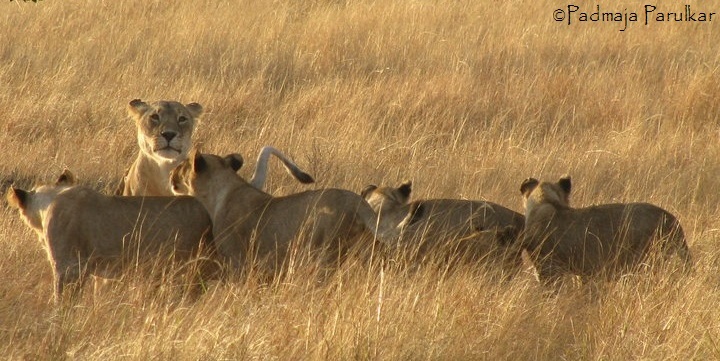 But the lionesses were feeding on a wildebeest and couldn’t be interested in the cheetah or its kill for the time being. 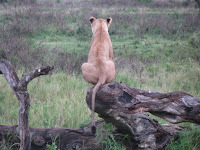 The lioness too was vigilant, surveying the territory, vulnerable as she was with two cubs. 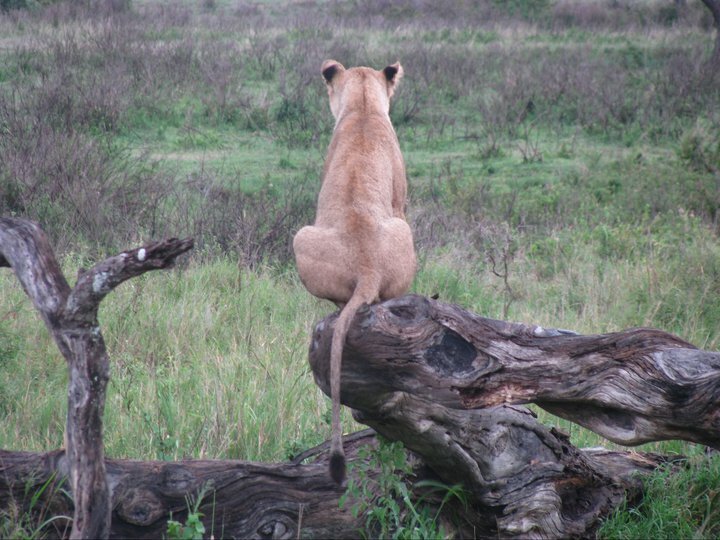 In the savannas, nobody is all powerful and even the cats have their weak moments, we were to discover. 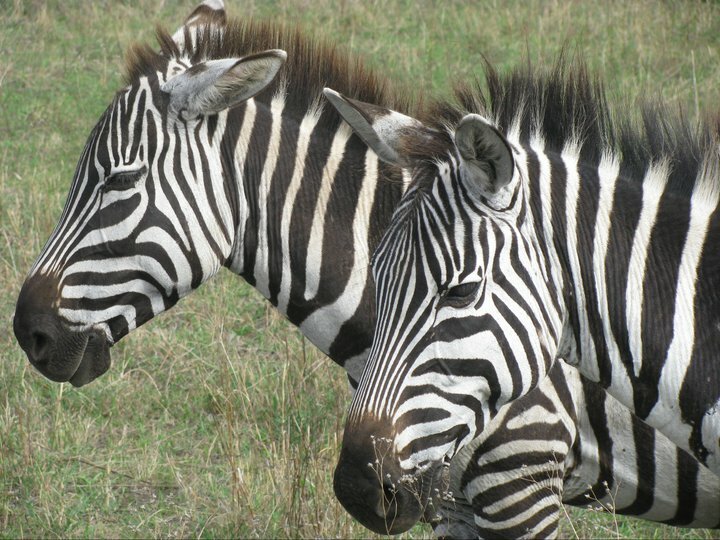 We come upon multitudes of zebras; pairs nuzzling each other in a show of affection. Zebras with their black-and-white stripes and rippling muscles make for superb portraits and if I had my way I would have trapped all of them in my camera with their individual stories. There are birds, the size of mammals – Kori bustard and Saddle-billed storks, baboons, gazelles, buffaloes, elephants, but above all, Serengeti is the province of the superherd, the wildebeest that share a symbiotic relationship with the savannas. We witness waves upon waves of white-bearded wildebeest in a parting shot as we leave Serengeti behind. Lake Manyara Biosphere Reserve would be a tame affair after the mighty Serengeti, but I was eager to see Scottish biologist Ian Douglas-Hamilton’s preserve where he undertook pioneering research on the behaviour of African elephants. Also known for its tree-climbing lions it would be a different ballgame, we presumed. According to William, the driver-guide, lions climb low onto trees to avoid tsetse flies that bother them during the drier months. Earlier, in Serengeti Serena, we had come across blue-black rags tied to poles like pennants, apparently to attract and trap tsetse flies! Imagine our horror at encountering tsetse flies and not being warned about them. But to get back to Lake Manyara… here was a different habitat, more like the woods of India, albeit with African flora of baobabs, sausage trees, giant figs and mahogany. 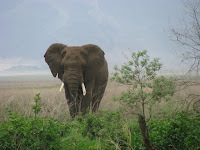 Even as we had started on our game drive, two elephants feeding by the roadside blocked our path. I was consternated at the sight of one of them fanning its ears menacingly and for once the cocoon of our vehicle seemed vulnerable. What a contrast, I couldn’t help comparing, with Douglas Hamilton’s bravado in undertaking the hazardous task of photographing elephants with ears spread out, for identification, at times crouching on trees or even on foot! Not wanting to antagonise them, the driver backed off. Finally, they slipped into the thicket clearing our way. 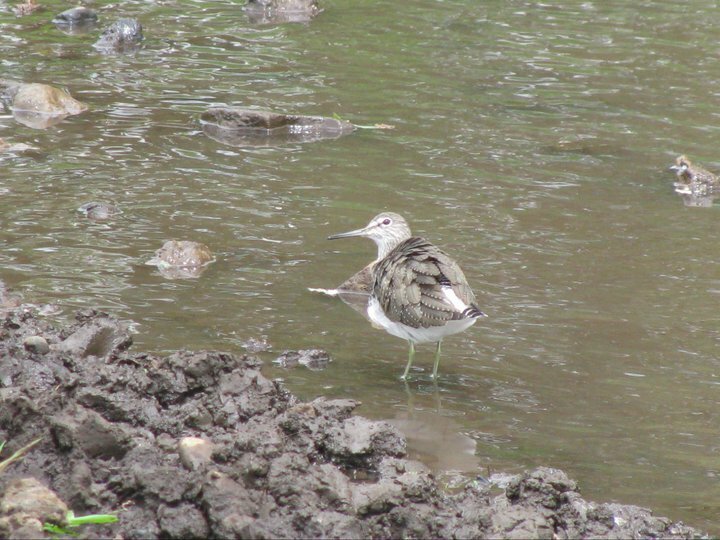 As we left the jungle behind, we came into a clearing of open grassland with its green down and melange of birds – hornbills, plover, storks and marabous. Herds of buffaloes and wildebeests in repose made the park look a Garden of Eden, indeed. Some of the most memorable moments in safaris are often those that cannot be captured on camera. The cheetah hunt at Serengeti was one such episode: the scene was so charged with suspense that I didn’t want to blink, leave alone prepare to shoot. The Serena properties where we stayed throughout were not fenced unlike many of the lodges in Kenya. In Serengeti, we had to be escorted with askaris to and fro from the dining hall as elephants, buffaloes and even, leopards were known to prowl at night within the lodge premises. During the daytime, though, we tended to forget this fact. A pair of dik-diks would roam around our ground floor sit-out and my son would chase them eager to pet. Imagine our horror, when that evening, the dik-diks were replaced by a pair of buffaloes peering into our room accompanied by a background score of a lion roar warning its territory. We hadn’t had our dinner yet and were not sure if we wanted one now! Interestingly, the askaris who accompanied us did not carry a gun but only a torch, which they flicked about spot-lighting the surroundings only increasing our anxiety. The hotel staff maintained that there had been no man-animal confrontation in all the years of the lodge’s existence. At Manyara Serena, the hotel staff were emphatic that no game strayed there as the lodge was outside the National Park, though we had seen some bushbuck stroll below our balcony. After the afternoon game drive, the elephant blockade fresh in mind, we sauntered into the lodge chatting away walking up to the room. Fellow lodgers - a couple - stopped to say hello or so we thought; instead they greeted us, saying, “Look there, by the (swimming) pool, elephants!” My heart stopped beating as I saw two grey hulks appear over the curve of the hill walking parallel to us, the lodge rooms dividing our paths. Our friends turned to their room leaving us alone to decide our fate. Silently, we kept walking, praying, and managed to reach our rooms, safely. From our first floor balcony, just in time, we caught a herd of three, including a calf, within whispering distance! I shudder to think, what would have happened if our family of three (me, my husband and son) had come face to face with the elephant trio. Very nice.You have weaved the words to paint the picture which we can see through your lens. 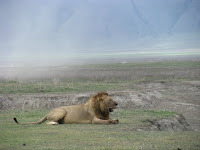 Specially the cheetah killing and lioness watching, brings the view and gives the feeling of goose bumps. 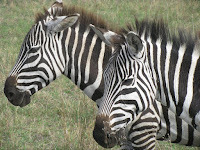 Keep it going Padmaja.Your blog on theSerengeti reminds me of our trip to Namibia. Brilliant work. I couldn go through all the content but among the ones which i have read,this write up is amazing.Job well done. Keep them coming.